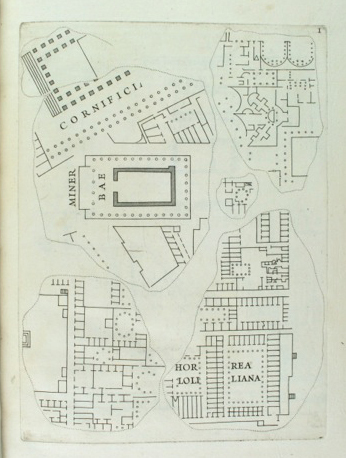 Fragments of the plan were rediscovered in 1562. In 1673, Giovanni Bellori, Commissioner of Antiquities of the Papal States, published engravings of the extant fragments for the first time. This publication is the first broad dissemination of the fragments, which had previously been illustrated only in ink drawings (today held in the Vatican Libraries, Codex Vaticanus Latinus 3439, f. 13-23). 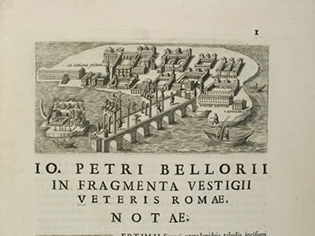 The publication contains 20 full-paged engraved plates, based on Bellori’s direct examination of the fragments held at Palazzo Farnese and drawings from the Vatican manuscript. As this is the only edition of Bellori’s publication, we are pleased to have been able to acquire a copy for the Notre Dame Libraries. For a complete bibliographical history of the Forma Urbis fragments, see the Past Scholarship section of the Stanford Digital Forma Urbis Romae Project. Originally published by Tracy Bergstrom at italianstudies.nd.edu on November 19, 2014.